Qualcomm Fastboot Upgrade C Tool is a small application for windows computer which allows you to Flash the Stock Firmware on Qualcomm Smartphone and tablets. Here, on this page we have managed to share the latest version of Qualcomm Fastboot Upgrade Tool along with the previous versions. It comes as a portable application and does Not need to be installed on the computer to use it. Simply Download and extract the Tool package on the computer and you are ready to use it in No time. The overall user interface of the tool is very clean and comes with the exact feature only. It is basically created to Flash the Stock Firmware on Qualcomm devices only. The very Less Options available in the Tool makes it less confusing and a beginner can also understand to operate the tool in a single usage. The Tool also comes with the Login feature to load the firmware. It allows you to flash the stock firmware on Qualcomm Based Smartphone and Tablets. In order to load the firmware in the tool you need to login into the tool by using the admin password. 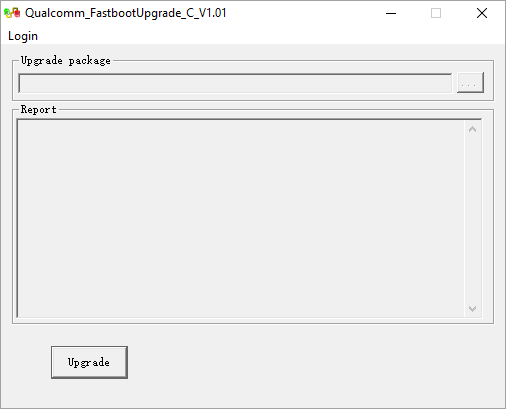 [*] How to use Qualcomm Fastboot Upgrade C Tool: If you want to learn how to use Qualcomm Fastboot Upgrade Tool to flash Stock Firmware then head over to the How to Flash Firmware using Qualcomm Fastboot Upgrade Tool page. [*] Caution: We recommend you to take a backup of your personal data before flashing the stock firmware using the Qualcomm Fastboot Upgrade Tool. As your personal data may be permanently deleted after flashing the stock firmware.